Beautiful red flowers for Christmas. The Christmas poinsettia isn’t really a flower at all but the beautiful bracts look so much like flowers, do we really care what the botanists call these beautiful red flowers? Do you think that William Curtis would have ever thought people would still be loving his work over 225 years after he first began publishing The Botanical Magazine. At one time, each of the gorgeous botanical illustrations in his magazine were made from copper engravings and were hand-colored. Curtis died in 1799 but his friend John Sims took over and changed the name to Curtis’s botanical magazine. How lucky for all of us that Sims honored his friend by continuing this wonderful magazine! 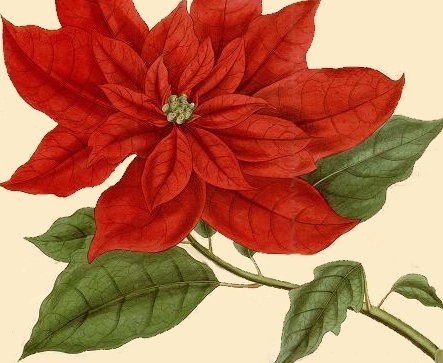 This poinsettia flower drawing is from 1836. I don’t have an illustrator to share with you. So much of the scan picked up the facing page that I’ve gone ahead and edited the image so you can use it with little fuss. I think it’s a stunning drawing and a bit different in that the flowers at the top were left incomplete, going to the edge of the original drawing. I cropped two of the leaves a bit to match the feel introduced by the artist’s treatment of the flowers. I wish I had a larger version of this Christmas poinsettia drawing to share with you but alas, this is as good as it gets.